Barbecue season doesn't have to mean juicy meats with mayo-laden side dishes! There are healthy ways to celebrate outdoor dining. Barbecue season doesn’t have to mean juicy meats dripping with sweet, gooey sauce. And outdoor dining doesn't have to equate to overly indulgent lazy Sundays complete with mayo-laden side dishes. There is a whole more to a barbecue — and gasp! — there is actually a healthy way to celebrate warm weather and outside dining. Take a twist on foods you’d usually enjoy cold for a grill experience like no other. Avocado toast? This summer we’re going avo roast. Throw peeled avocado halves on the grill for a hint of smoky flavor, or grill your pineapple before adding it to a pineapple cucumber salad for a dish that screams summer. Go plant-based for an entire meal. Pick out your favorite summer veggie and throw it on the grill with some olive oil, salt and pepper. 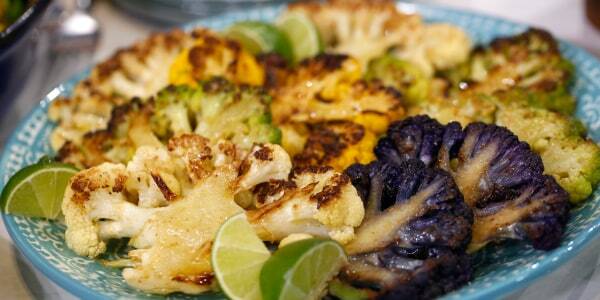 I promise that a grilled cauliflower steak can be just as “juicy” as grilled beef steak. Does just veggies seem like a steep request? Grill your tomatoes before adding them to a farro and mozzarella salad for a heartier, well-balanced, protein-rich meal. 3. Fire up the flavor. Try marinating your mushrooms, eggplant slices or zucchini in a little olive oil and seasoning such as thyme, oregano, rosemary or even in chicken broth. It’s a great healthy option for adding loads of flavor before throwing them on the grill. If you still want to add meat to the mix, make sure to marinate that too. 4. Think outside the bun. Instead of dogs and burgers, take your favorite poke bowl combo outside with grilled tuna steaks. Sear the tuna only for a few seconds before topping a summer salad or slicing over summer slaw. When you want to be the hostess with the mostest you don’t have to go with pigs in a blanket to win over your guests. Take it up a healthy and tasty notch by stuffing jalapeños with a little goat cheese before wrapping them in prosciutto. Enjoying one or two of these poppers will feel indulgent, but will keep your guests from feeling too stuffed to enjoy the rest of the spread. 6. Make friends with dessert. Your grill doesn’t stop at burgers and dogs. Brush some peaches, pineapple and plums with a little bit of honey and a sprinkle of nutmeg. Toss them on the grill for 3 – 8 minutes, depending on how hot the grill is and serve on a stick or with a spoonful of ricotta and fresh mint. For more from Keri Glassman, follow her on Instagram. For more healthy eating advice, sign up for our Start TODAY newsletter.